Warner Bros. is making it easy (and cheap) for you to upgrade your old DVDs to Blu-ray Disc with their DVD2Blu trade-in program. 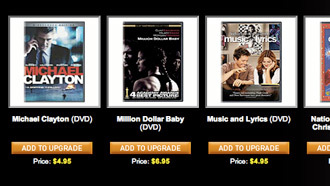 Most Blu-ray Disc titles will run you $4.95, with a few priced a bit more at $6.95. Among the 91 titles presently offered are Gran Torino, The Departed, Deliverance, The Golden Compass, and Full Metal Jacket. How does this program differ than Warner’s RED2Blu offer where you can trade in HD DVDs for Blu-rays also for $4.95? The RED2Blu program only requires you to send in the sleeve (you can keep the HD DVDs), while the DVD2Blu program requires you to send in the disc without any packaging. A maximum of 25 DVDs can be upgraded at one time. Check out a few more selected titles below, or visit the DVD2Blu website to see all.